Save now! Substitute these items with qualifying purchase at a reduced price*. Upgrade from 45 square foot to 55 square foot sail. Includes sail upgrade, heavy duty mast upgrade, and spar extension. Famous sailmaker Neil Pryde International's dacron sails available in four color schemes. Upgrade to a quick-release leeboard mount and save time setting up, dismantling, and packing away. Increasesed thread durability. Only for rigs with u-shaped front assembly. Highly recommended! *Please note: Upgrades are substitutions for standard components and can only be purchased at the upgrade price with a sail rig or the standard component being upgraded. Includes just the pontoons and the arms that snap into the crossbar. For sail kit owners and others that already have a crossbar. Best performance; excellent even in strong wind that submerges them. Includes just the pontoons and the arms that snap into the crossbar. For sail kit owners and others that already have a crossbar. More portable, good performance in weak and moderate winds. These kits come with one oar. The rest of our kayak kits come with two. It’s more comfortable to steer with the oar on the same side as the sail. 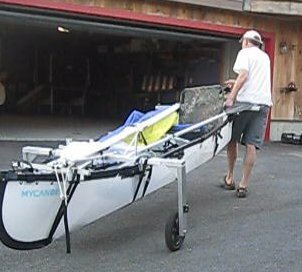 With two oars you won’t have to move your oar direction changes. Just switch hands letting the other oar trail behind freely. Big enough for the sail rig and more. Strong fabric and strong zipper. Picture may not be 100% accurate. Get your kayak pumped up nearly to the top with ease, then just top off with the hand or foot pump that comes with your boat. (Alligator clip adaptor and hose shown are not included). Lets you adjust mast position forward to tune the boat for perfect steering balance. Find the perfect mast location for your boat and your preferences! Reduced "weather helm" (tendency to turn upwind), means less effort to hold a straight course and less rudder drag slowing you down. . Many no-cost color schemes available to suit your taste. From pirate sail to plain white to bright primary colors. Extra straps are so handly to have! You will find many uses. Lightweight stainless-steel buckles instead of the usual clunky pot-metal buckles sold elsewhere. Slip-on wheels work equally well on kayaks, even inflatables. Conveniently, easily move your kayak on land. Submersible, leave them on for launching and slip off when the boat has enough water under it. Slip on for pulling out. Wheels mate with sail kit front crossbar.